I found out that this book is rather controversial after reading all the comments left by other readers on Amazon, most are disgusted by the historical inaccuracies and personal agenda of the authors. Even I have to agree to a certain extent. At the end of the book, you'll get the impression that Norman Rockwell, Leyendecker's competition, is nothing but vile. 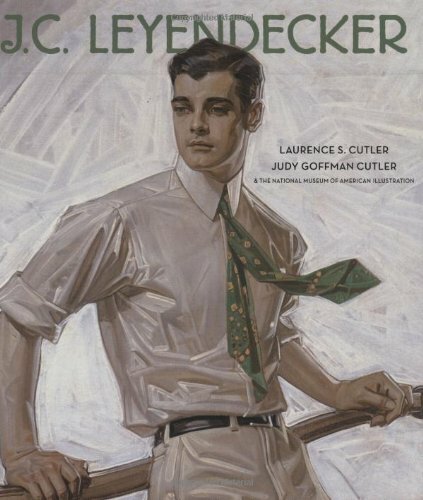 One reader even pointed out a knock-off painting that was mistaken as an original Leyendecker work. These are only two examples. In short, you should get this book for the art and not the text. Leyendecker's paintings is easily identifiable by the exaggerated, quick brushstroke effect, or crosshatched strokes with oil paint. The reason why I bought the book was to check out how he draws the folds on those clothes. His command of drawing clothes and drapery is masterly. His more iconic pieces would be the Arrow Collar Man, New Year babies, and the covers for Saturday Evening Post. Plenty of cover art he did for magazines are also included, although it's small at 9 per page. I thought the scans and reproduction of the paintings are pretty good. Yes, there might be yellow stains on those old copies of Saturday Evening Post but note that these paintings are from before the 1950s. The large illustrations are reproduced well, showing the texture of the medium. I like that his portraits are full of form and solidity, which I understand are drawn with models as reference. The included biography is controversial but I didn't really buy this book for the text. All said, it's still a very decent archive of Leyendecker's work. Interesting. Will probably add this to my "to buy"-list at some point, which is way too full at the moment. Thanks for the review.